Rembrandt Harmensz van Rijn (Dutch, 1606–1669) was a Baroque painter and printmaker best known for his self-portraits and illustrations of biblical scenes. He trained under two masters: Jacob van Swanenburgh (1571–1638), who specialized in cityscape paintings and scenes of hell and the underworld, and Pieter Lastman (1583–1633), who specialized in history paintings. Given his education with both masters, Rembrandt’s works reflect the strengths of both artists. Swanenburgh’s specialization in scenes of hell required proficiency in painting fire and its effects on surrounding objects, perhaps sparking Rembrandt’s fascination with the effects of light. Studying under Lastman, Rembrandt mastered historical paintings, which required complete command of all subjects and a great attention to the narrative of a scene and the figures within. In 1628, Rembrandt decided to take his career in a completely new direction when he completed his first etching. Etchings are produced by heating a wax-like resin and spreading it over the surface of a copper plate, creating an acid-resistant ground. Next, lines are drawn into the wax, exposing the plate that is then submerged into acid; only the exposed areas will be bitten or dissolved. These etched areas can then be inked for printing. Rembrandt’s style is recognizable for his softly variated lines, achieved by using a method called “stopping-out” in which he applied varnish to areas that were sufficiently incised, thereby halting further etching and then re-exposing the plate to acid. 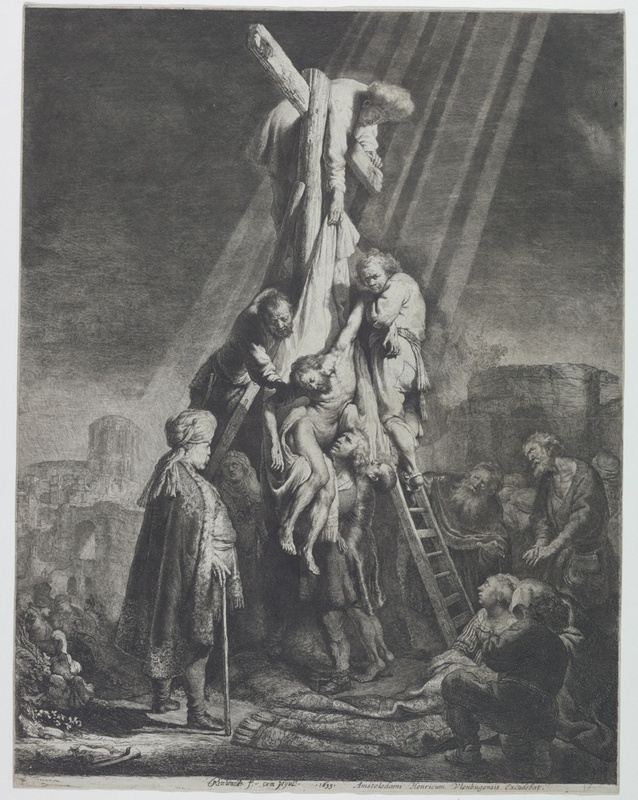 The Descent from the Cross, dated 1633, is an etching from a series highlighting classic religious scenes, titled The Passion of Christ, commissioned by the secretary of the Prince of Orange, Constantijin Huygens. The Descent from the Cross illustrates a group of men taking Christ down from the cross after his crucifixion. It is believed that Rembrandt produced his iteration of this iconic scene in response to Peter Paul Rubens’ painting of the same scene from 1612–14. In contrast to Rubens’ iteration, Rembrandt allows this piece to be more responsive. He creates a genuine sense of suffering through the detailed expression on all of the figures’ visages causing viewers to feel a compelling involvement. From Christ’s pained expression to the way in which his body twists rather unsettlingly, this scene shies away from an often-idealized depiction. While the men pull Christ off the cross they bring forward a sense of weight as they cling onto his lifeless form. Rembrandt also uses complex lighting to enforce the importance of the occurring scene; rays of light shine down onto the central figures casting bystanders into the shadows and creating a hierarchy of importance. McVinney, L. Donald. Rembrandt and his Afterimage: Purchase, New York, NY: Neuberger Museum State University of New York at Purchase, 1982. White, Christopher. Rembrandt as an Etcher: a Study of the Artist at Work. 2nd ed. New Haven: Yale University Press, 1999. Wetering, Ernst Van de. “Rembrandt van Rijn.” Encyclopædia Britannica. March 24, 2017. Accessed September 29, 2017. https://www.britannica.com/biography/Rembrandt-van-Rijn.